While the pioneer leaders were the architects of Singapore, everyday heroes helped build society here. This is another story of our Merdeka Generation, those born in the 1950s who lived and persevered through a tumultuous period. For most people, a bowl of shaved ice chendol is a favourite respite from sweltering hot days. But for 66-year-old Bedah Madin, it is a humble treat that changed the course of her life - from once barely making ends meet to running a stall where she sold up to 200kg of chendol a day. Madam Bedah runs the popular Cendol Geylang Serai stall with her 80-year-old husband Yunos Maideen and their family. Born into a family of eight siblings in 1952, Madam Bedah grew up in Kampong Ayer Gemuruh in Changi during the 1950s. Her father was a taxi driver and her mother was a housewife who sold dodol, a sticky Malay delicacy, from home. For a couple of years, her mother also ran a food stall selling Malay dishes such as tahu goreng (fried tofu) and bubur kampung (porridge). "Life was simple, we had enough to eat," she said. At 16, Madam Bedah learnt sewing. She worked at a tailoring shop in Changi Village, earning $5 a day. "This was during the British times. I would sew and alter dresses for the British wives," she said. "When I got married at 19, I stopped working at the shop and took some tailoring orders at home." "Life was hard," added the mother of five children. "Sometimes, we did not have money to send the children to school." Her husband did not have a stable job then. "To make extra money, I even cooked at weddings for over 1,000 or 2,000 people," Madam Bedah said. 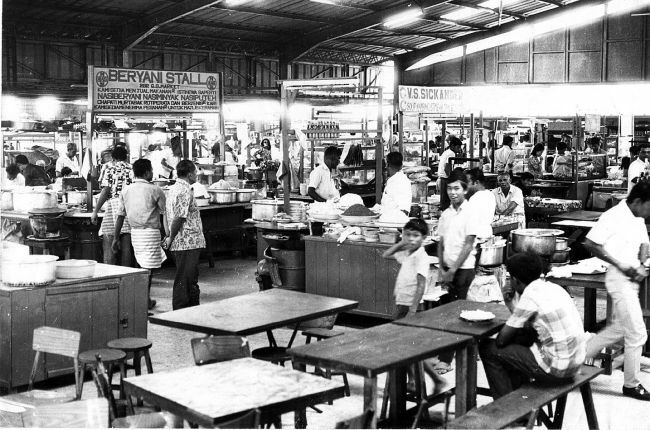 In the early 1970s, they set up a stall selling chendol at the old Geylang Serai Market with just a table. "The chendol shop was my husband's idea. His father used to sell chendol in a provision shop in the 50s," she said. "There was a thin strip of zinc roof shelter over us and all the stalls were huddled underneath." "Back then, there were no partitions between the stalls. We had just our tables. You could look at your neighbours at their stalls and ask them, 'What are you doing?'" she added with a laugh. They sold a simple chendol dessert, made with gula melaka (palm sugar), coconut milk and a green rice flour jelly made from scratch. Over time, their pale green handmade jelly strips, a closely guarded secret passed down from her father-in-law, earned them fame. Madam Bedah's day would start at 5am daily. "I would wake up early to prepare things for my children and send them to school," she said. "The stall opened at 8am because, believe it or not, some people eat chendol even at seven or eight in the morning." The couple would close the stall at 6pm before returning later at night to prepare for the next day. "I had to stir the chendol continuously by hand for two to three hours. Back then, there was no machine. It was a very difficult job. By the time I was done, it was around one or two in the morning," she said. Customers would come from all over Singapore, and as far as Indonesia and Brunei, to try her dessert. "One day, there was this lady who came down when we were about to close our shop," she recalled. "I told her to come tomorrow because there was no more coconut milk. Then she started to cry and said that she had come all the way from Jurong. "I felt sorry for her, so I went to make a small batch for her. When she got the chendol, she was so happy. Eventually she became our regular." Madam Bedah remembers the chaos and excitement in Geylang during the Ramadan fasting month in the 1980s. Her family would make 150kg to 200kg of chendol each day, and it would sell out at the permanent stall and the temporary stall in the bazaar next to the market. "Ramadan was the busiest period for us. The queues were so long from the moment we opened our shop, all the way till 11 at night," she said of customers who wanted to break fast with chendol. "My nieces would come over to help and there would be five or six of us crammed in the stall, working through the day. We had to take turns to take breaks." In 2009, the stall moved to the second floor of the current Geylang Serai Market. These days, her son runs the stall with the help of an assistant. "Now I can finally stay at home and rest, thanks to God," said Madam Bedah, who lives just a few streets away from her stall. "Geylang will always be a special place for me. When I got that chendol stall, my life changed."